Growing up my father could make two dishes, fried potatoes and meatloaf. We ate a lot of meatloaf on the nights my mother was at work, a lot of meatloaf. Now don't get me wrong, my father's meatloaf was pretty good, it was moist and the sauce had a nice taste. It was just that after having the same meatloaf for the first 18 years of my life, I became a little bit burnt out. So in college and most of the first couple of years of my marriage I didn't have meatloaf. Then about five years ago I slowly transitioned myself back into cooking and eating meatloaf. I discovered that turkey meatloaf can be delicious and a lot less fat than its traditional counterpart. As I was looking through the April issue of Better Homes and Gardens Magazine I noticed a recipe for Southwestern Turkey Meatloaf which looked simple and delicious. This recipe has 11 ingredients and 5 optional ingredients. It takes approximately 2 hours of prep and cooking, 30 minutes of which is active and makes 8 to 10 servings. I had no problems finding any of the ingredients at my local store and made no ingredient modifications. Make sure to adequately rinse the canned beans or they will taste metallic. 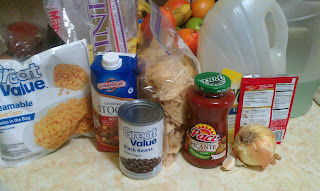 I chose to use tortilla chips for this recipe, it was the one type of chip I could guarantee my boys would eat the leftovers. I used mild picante sauce, but if I was to make this recipe again I think I would use a hotter sauce. The taste was a little too mild for me. For the toppings I chose to use cheese, jalapeno and lime wedges. My meat loaf took a total of 1 hour and 15 minutes exactly, I followed the remainder of the recipe as written. I was very impressed by how flavorful this meatloaf turned out. It makes a very large meatloaf. I made one giant meatloaf, but it could just as easily make two smaller meatloaves. The meatloaf was a little dry by itself, but with the cheese and lime it was much more moist. I think if I made this again I would add the whole bottle of picante sauce and add a tablespoon of taco seasoning. With only a teaspoon of seasoning, the flavors weren't bold enough for my liking. For a turkey meat loaf recipe this dish turned out well and my youngest son absolutely loved it. For the recipe go to Southwestern Turkey Meat Loaf. Thanks :) I liked the southwestern flair to the recipe also, it wasn't different than usual meatloaf, which I liked. I would definitely increase the amount of taco seasoning.